This fried lumpia recipe I have here is similar to lumpiang shanghai but it is quite unique because it has a pork asado filling. 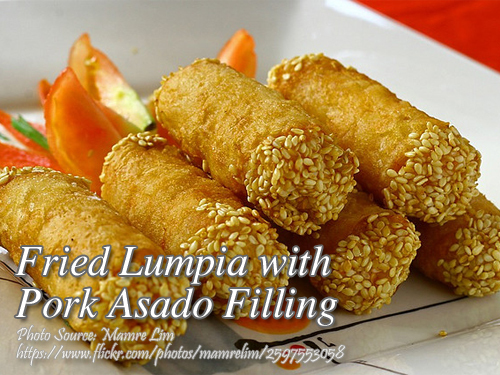 If you are craving for a pork asado siopao and fried lumpia, why not combine them and make a fried lumpia with asado filling? Not only it as a unique filling, it is also coated with sesame seeds for extra crunchiness. Anyway the filling is not composed of only pork asado. It also has veggies like bamboo shoots and mushrooms. To prepare the pork asado, saute garlic and onion in oil until soft and fragrant. Add liempo and stir-fry for 5 minutes. Mix soy sauce, brown sugar and vinegar in a bowl. Pour into sauteed meat. Add bay leaves and simmer for about 20 minutes or until meat is tender. Combine the first 9 ingredients in a bowl; shrimps, pork asado, mushrooms, bamboo shoots, rice wine, egg yolks, flour, pepper and salt. Wrap ¼ cup of the meat filling in each lumpia wrapper. Brush with white egg and roll in sesame seeds. Deep fry in hot oil until golden brown. Drain in pepper towels to remove excess oil. Serve hot with vinegar and crushed garlic dipping sauce. Manny Montala is a webmaster and admin of this blog and one of his interest is on the area of Filipino dishes and recipes. Please visit this blog often and bookmark. Please read my about page for details. Thanks for visiting. Anti-Spam Quiz: Which is colder, ice or steam? Get Your Latest Recipe by Email! If you want to receive email updates about our newest recipes delivered to your mailbox, put your email on the box below and hit subscribe button!